Hubby mentioned the other day that his favorite meal is beef with gravy on rice. He complained that I never make it. I was baffled because to me it's a boring meal and I said as much. But, being the good little wife that I am, I purchased steak tips when we went shopping this week. Here's a picture of what I served hubby tonight. (His 2nd serving so the beef isn't as plentiful.) 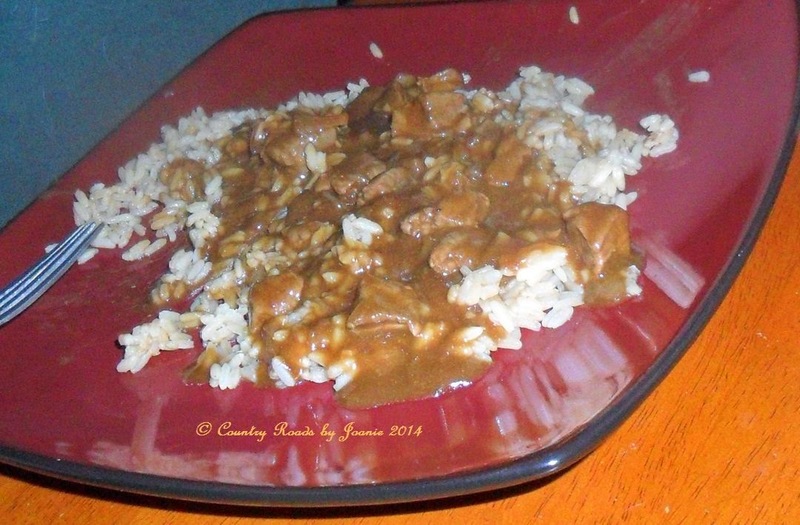 Easy recipe, slow cooked beef, beef gravy and rice. Salad on the side. I spiced it up a bit with some garlic and chopped onion. I thought it tasted good. Hubby said it was "delicious" which is 5 stars in his language. It was a pleasant dish for a change, but all I could think of was my Dad and how every time my mother made this dish he commented that it reminded him of the "best meal" he ever got at the mess hall during WWII. On this Memorial Day weekend I want to thank all Veterans for their service, with a special Thank You to my Dad in Heaven and all WWII Veterans, Thank you for your service. It's your efforts that give me the freedom to make this post. God Bless!